I hope you had a great 4th of July! Today’s post is all about the big planes: 777s, 767s, and now the new 777-300ER. American Airlines today announced Los Angeles – London Heathrow as the next route to feature the highly anticipated Boeing 777-300ER. Beginning next summer, customers traveling between Los Angeles International Airport (LAX) and London Heathrow Airport (LHR) will have the opportunity to enjoy the world-class travel experience the new aircraft offers. Their first 777-300ER will go into service in December when they start flying the new plane on the Dallas – Sao Paulo route. Then in February 2013, they’ll add a second route with New York JFK – London Heathrow. 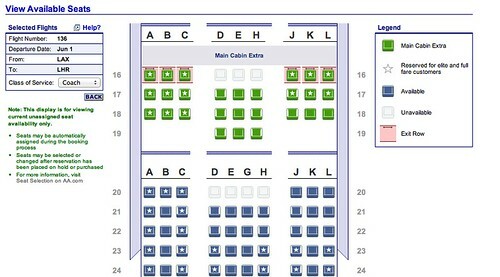 Economy: 3/3/3/ seating with new Main Cabin Extra seats, 3/4/3 seating in the rest of the main cabin. The inaugural flights will be June 1, 2013 with AA 136 (LAX to LHR) and AA 137 (LHR to LAX) and right now it’s wide open. I also looked to see if any MileSAAver awards were available in Economy, Business, or First. No luck. However, Expert Flyer was showing one First Class upgrade available. I’m really excited about thew new 777-300ER and can’t wait to ride one. I’m eager to see the new entertainment systems, try out the new premium seats, see the new walk-up snack and refreshment bar, and check out the new Main Cabin Extra seats. And I’ve never been on an inaugural fight, so I’ve been thinking about booking a ticket on one of the maiden 777-300ER flights just for fun! The only domestic 777 route is between LAX and Miami. Go here to see the entire widebody schedule. Hello – maybe I’m missing something, but on the google doc, it says all service is supposed to start 6/14. I’m not noticing that all of the routes have started yet (e.g. ORD>HNL). Is there an update for the effective date on these routes? @ Scotty – The schedule is effective June 14 – August 20. I fixed the spreadsheet so that it’s visibile now. Thanks for bringing it to my attention! I always feel that wide-bodies make you feel like you’re properly flying! @ MilesFromBlighty – I agree! Widebody or now, most of us would be happy if they could just go a day without canceling 10% of their flights. AA is really bad to fly with anymore. A bit early to announce as anything can happen. Remember how evryone was gung-ho about UAs IAH-AKL? Thank you for this update. We look forward to trying out these new planes. Did I notice 3-4-3 seating in coach. They got to be kidding. Can you imagine sitting in one of those from LA to London? 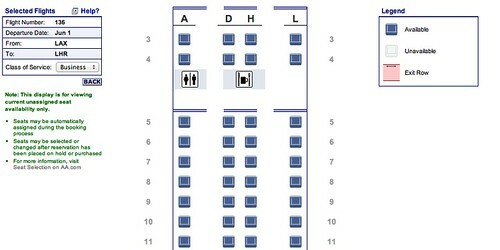 10 seats across in coach is going to be terribly miserable. If you have a choice do NOT fly in this aircraft.